The NFL Season has concluded and so has the first two rounds of the playoffs. This has been a very interesting year in the NFL and there is still a lot left to happen! Although, since the Regular Season has concluded, it’s time to talk some hardware. Who is going to pull away with some awards this year and who will win the league’s most coveted award, the MVP. Tailgate Sports has had a couple analysts vote on who they think will win each award below. I am going to explain my reasoning as to my picks and then give you the Tailgate Sports NFL Award recipients. Derwin James has played safety with some of the best in the league. He not only was a top rookie around the league but he has been recognized as one of the top players at his position. The All-Pro teams were released this last week and Derwin James not only made 1st team but also made the 2nd team which is something incredible to be done by a veteran in the league nevermind a rookie. He made 1st Team as a Safety and 2nd Team as a Defensive Back/Cornerback. He had 105 tackles playing safety which is an incredible number for someone who does not play Linebacker. He also had 3.5 sacks, 15 passes defended and 3 interceptions on the year. What he was able to do for the Chargers this season has strongly impacted their defense and definitely shows why he deserves the award. Barkley is another rookie who has thoroughly impressed and has lived up to all of the hype he built up in college. Barkley was able to tally 1307 yds and 11 touchdowns on the ground while also catching 91 passes for 721 yards and 4 touchdowns. He was the Giants ENTIRE offense. He averaged 22 touches a game and led the NFL in entire scrimmage yards with 2028 yards. For a guy to come into the league and dominate as much as he did especially with another elite level talent on the team in Odell Beckham Jr. is something spectacular. Barkley has the brightest future ahead of any rookie in the entire league and he proved it by having such a great season for a team with 5 wins. The All-Pro first team Defensive End has shown why he is so dominant in this league yet again this season. 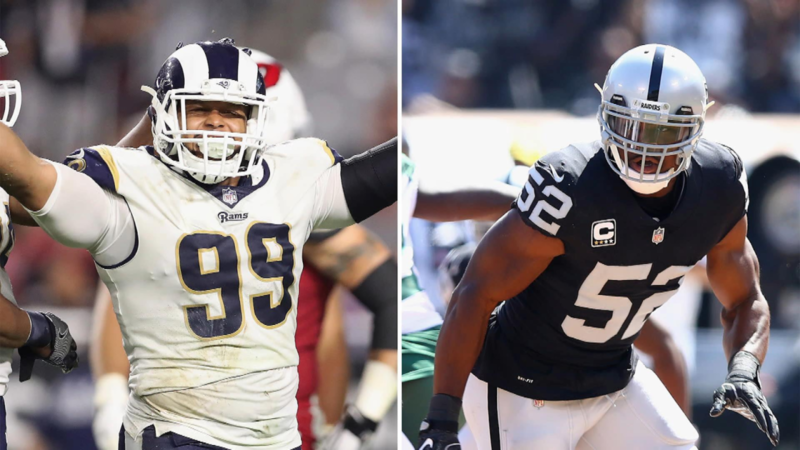 Khalil Mack has dominated any opponent he has faced and has been the face of the top defense in the entire league. He battled an injury which made him miss a game or two but overall he has shown his dominance. He forced 6 fumbles and had returned an interception for a touchdown. Mack has now claimed his third first team All-Pro selection in just 5 seasons of his career. Just watching him play football you know he has ability to make plays, stop the run, and put tons of pressure on the quarterback. I don’t want to get too much into Mahomes as he will be mentioned later on in this article but I will touch on some things that I guess the stats can’t tell and some team stats that he had a huge impact on. Mahomes led the Chiefs to the Number 1 seed in the playoffs and a conference championship appearance this year and also had the best offense in the entire league. The Chiefs scored 35.3 ppg which is tops in the league and that is in large part thanks to Mahomes. The Chiefs offense also came away with 3.12 pts per drive which is number 1 in the league as well. Mahomes has done some great things like dishing out a no look pass in a game. He makes all his reads extremely quick and can really sling the ball and can even make clutch passes with his left hand. If you watch one game, you’ll see just why he should be the OPOY. Anthony Lynn has done a tremendous job with the LA Chargers since taking over last season. He took over a team that finished 5-11 in 2016 and moved them to 9-7 and now this season finished 12-4. He took a team that was struggling and has turned them into essentially an AFC powerhouse. He has the Chargers at a Top 10 Offense and Defense and playing beyond expectations. He also has also done a great job developing his players. He has drafted and developed 1st round WR Mike Williams, 5th Round DB Desmond King, 1st Round DB Derwin James, and undrafted RB Austin Ekeler. James and King both were All-Pro players this season and Williams and Ekeler are on the verge of breaking out. Lynn put together a good season getting the Chargers to the Divisional round and if it wasn’t for the Chiefs, who they beat in Arrowhead, the Chargers would be the #1 Seed in the AFC. Now that we talked about what Mahomes has done for his team and how he leads them let’s talk about the numbers and the reason he is this year’s MVP. Mahomes led the league in Passing TD’s with 50, which puts him in company with Peyton Manning and Tom Brady as the only players to do so in a season. He also threw for 5097 yards with a completion percentage of 66.0%. He also led the league in Total QBR with 82.0. Mahomes led the Chiefs to a 12-4 record, the number one seed in the AFC and showed pure and utter dominance on the field every game he went out there. He continued to put up unbelieveable numbers even with the losses of Kareem Hunt and Sammy Watkins. Mahomes is flexing on the whole league and is the a once in a generation talent. He is the next legendary QB and in his first year as a starter is the NFL’s Most Valuable Player.